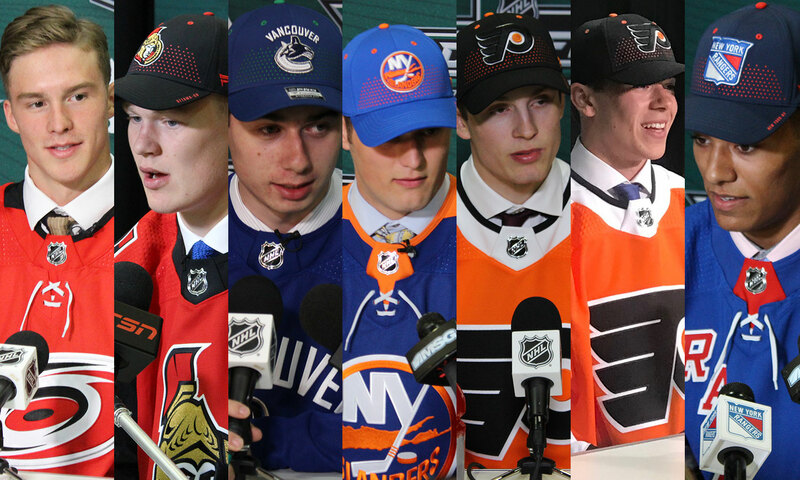 Photos by USHL/Nate Ewell - College Hockey Inc.
Four USHL players and three alumni were selected in the first round of the 2018 NHL Draft in Dallas, TX, tying the most opening round draft picks from any other junior league in the world and giving the USHL 32 first-round selections dating back to the 2015 NHL Draft. After the Carolina Hurricanes selected former Muskegon Lumberjacks forward and 2017 USHL Rookie of the Year Andrei Svechnikov second overall, the Ottawa Senators drafted Boston University's Brady Tkachuk with the fourth selection. The former Team USA forward recorded 31 points (16G, 15A) with Team USA from 2015-17 and won a gold medal at the 2017 U18 World Championships. This past year with the Terriers, Tkachuk tabbed 31 points (8G, 23A) in 41 games and won a bronze medal with Team USA at the 2018 World Junior Championship. Tkachuk joins Boston University teammate and former Waterloo Black Hawks forward Shane Bowers as the last two first round picks by the Senators. Three picks after Tkachuk was taken, the Vancouver Canucks nabbed another former member of Team USA in defenseman Quinn Hughes. The University of Michigan blueliner registered 29 points (5G, 24A) in 37 games with the Wolverines in 2017-18 en route to being named to the Big Ten All-Rookie Team. He also helped Team USA to bronze medals at both the 2018 World Junior Championship and 2018 Men's World Championships. During his USHL career, the Orlando, FL, native set the record for most goals by a defenseman with a four-goal performance on Dec. 30, 2015. He also was a member of the gold-medal winning U18 World Junior Championship team in 2017 and was named to the 2017 All-USHL Second Team. Hughes is the first player with USHL ties to be selected by the Canucks in the first round since 2018 NHL-All Star Game MVP and Calder Trophy finalist Brock Boeser (Waterloo Black Hawks), who was chosen 23rd overall by Vancouver in 2015. Four picks later, the New York Islanders selected Team USA forward Oliver Wahlstrom 11th overall. The Boston College commit led all Team USA U18 players in scoring last season with 45 points (22G, 23A) in 26 games and has recorded 58 points (31G, 27A) in 55 career contests in USHL action. The Philadelphia Flyers then chose the next two USHL players to come off the board, taking Team USA forward Joel Farabee with the 14th pick and Youngstown Phantoms forward Jay O'Brien 19th overall. Farabee, a Boston University commit, finished third among all Team USA players in scoring in 2017-18 with 40 points (15G, 25A) in just 26 games. O'Brien played five games for the Phantoms from 2015-17 and is committed to Providence College. The Hingham, MA, native was ranked 32nd on the NHL Central Scouting Final Rankings ahead of the 2018 NHL Draft. The final USHL player to be taken in the first round was Team USA defenseman K'Andre Miller, who was taken by the New York Rangers 22nd overall. The University of Wisconsin commit put up 16 points (4G, 12A) in just 22 games last season and was 23rd among North American skaters on the NHL Central Scouting Final Rankings. More USHL players and alumni will look to hear their names called Saturday during Rounds 2-7 of the 2018 NHL Draft, which will begin at 10 AM Central Time. Follow USHL.com's 2018 NHL Draft Hub as well as the USHL on Twitter for live updates, videos, and more from the 2018 NHL Draft.